BOISE -- The Idaho House of Representatives approved a joint memorial Friday opposing any introduction or reintroduction of fish species to the Snake River upstream from Hells Canyon Dam. The memorial, which was sponsored by the Idaho Water Users Association, directs the governor and attorney general to "undertake such action as is necessary and appropriate" to oppose such efforts and protect Idaho's sovereignty over state water resources. 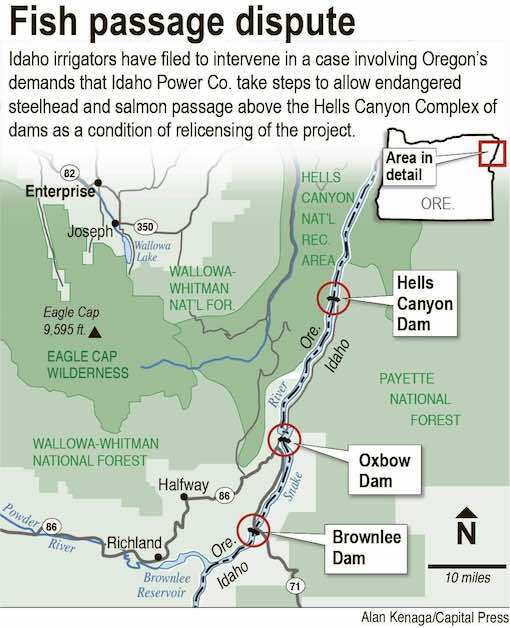 The legislation was prompted by Oregon's efforts to require fish passageways and the introduction/reintroduction of salmon or steelhead upstream from Hells Canyon Dam as part of the dam relicensing process. "Friends, I've seen few things in my lifetime that I think is a bigger assault on the sovereignty and primacy that Idaho asserts over these waters," said the floor sponsor, Rep. Van Burtenshaw, R-Terreton. "This is Idaho's water. They start in Idaho, they're our resource, and we can't allow anyone to have access to that most valuable resource." The memorial was approved on a voice vote, without debate. It now goes to the Senate.